The insulated tubes for humidification systems reduce wasted energy and reduce airstream heat gain and dispersion-generated condensate production. They reduce the thermal conductivity of dispersion tubes with polyvinylidene fluoride, an insulating material that will not absorb water or support microbial growth, due to its closed-cell construction, and it will not degrade when exposed to ultraviolet-C germicidal light. 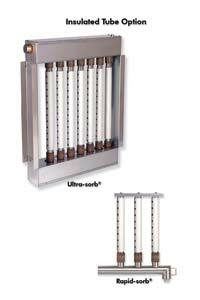 The tubes are available for new and existing Ultra-sorb and Rapid-sorb steam-dispersion systems.